in focusing on the economic revitalization of Pawtucket. As many of you know the Pawtucket Red Sox are proposing to invest $45 million as their part of the construction of The Ball Park at Slater Mill at the former Apex site. This investment is the largest commercial investment in Pawtucket’s history. It will serve as a catalyst for additional development along the riverfront and through the Northern RI area. 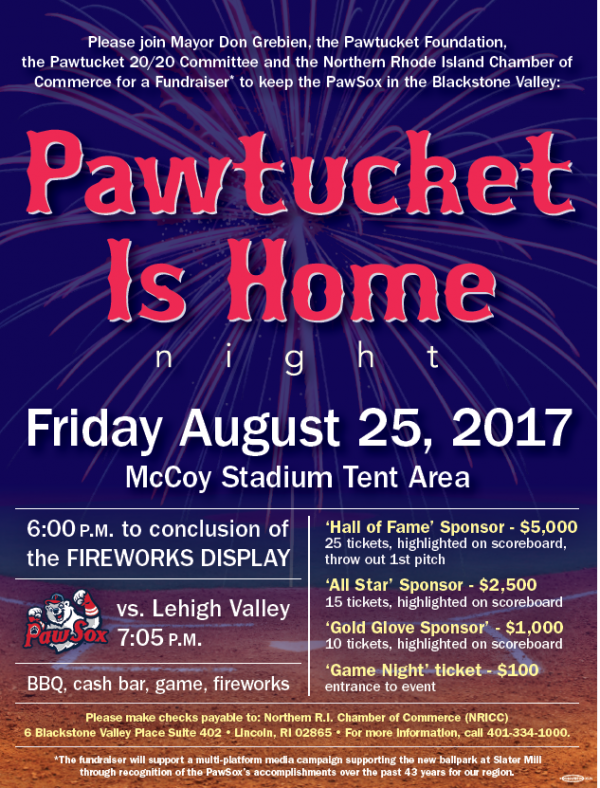 On August 25th these groups will host a fundraiser, "Pawtucket is Home" Night, at McCoy Stadium, with a goal of raising dollars to support a multi-platform media campaign supporting the new ballpark at Slater Mill. We need to make sure everyone understands that Pawtucket and all of Rhode Island could lose this treasure. Residents, fans, and Rhode Islanders are encouraged to come out to support this once-in-a-life time opportunity for Pawtucket, the Blackstone Valley, and Rhode Island. There will be a BBQ, cash bar, game, and fireworks.